Perfect for protecting 14 gauge SJEOOW wire such as pump cords. It is recommended that you purchase 20% more than the cord length you wish to cover to account for shrinking during installation. Price is per foot. Perfect for wiring up the meters, power supplies, SSRs, and other locations where two small gauge conductors are required. Price is per foot. Perfect for wiring up the XLR receptacles and other locations where more than two small gauge conductors are required. Included in our Electric Brewery Control Panel kits and Standard 30A Electric Brewery Control Panel Wiring Kit. Price is per foot. Included in our Electric Brewery heating element assembly (DIY kit). Price is per foot. Open style panel mount power relay. 110-120 VAC coil voltageDPSTNormally open40A contact rating (resistive) Can be used to switch lower current ratings as well (under 30A). Included in our Electric Brewery Control Panel kits. Open style panel mount power relay. 220-240 VAC coil voltageDPSTNormally open40A contact rating (resistive) Can be used to switch lower current ratings as well (under 30A). Included in our Electric Brewery Control Panel kits meant for international use. BLN (10x38mm) midget style fuse. Fuse holder sold separately. 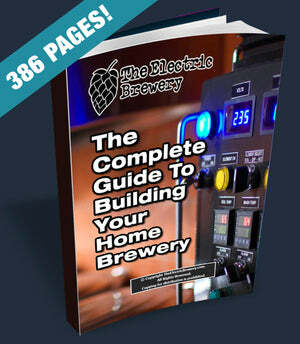 Included in our 50A Electric Brewery Control Panel kits. Two pole definite purpose contactor, DIN rail mountable. 110-120 VAC coil voltageDPSTNormally open32A max contact rating (resistive load) Can be used to switch lower current ratings as well (such as 15-30A). Two pole definite purpose contactor, DIN rail mountable. 220-240 VAC coil voltageDPSTNormally open32A max contact rating (resistive load) Can be used to switch lower current ratings as well (such as 15-30A).